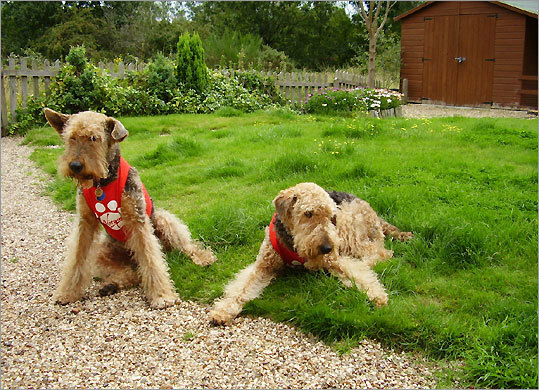 When my husband's company offered to transfer him to its office in the United Kingdom, my main concern was our Airedale terriers, Abbey and Grace. "We can't leave the girls behind," I said, "but we're not putting them into quarantine." Like many other pet owners, we were clueless about flying a dog overseas. It turns out that under rules launched in 2002 called the Pets Travel Scheme, vaccinated, microchipped pets can fly to European Union countries from the United States and Canada without spending six months in quarantine. Wading through the rules takes long-term planning. Depending on the destination, it can take from 21 days to six months to complete all the required tests and forms. The regulations offer plenty of opportunities for messing up. One mistake and your animal goes into quarantine. The key is to make sure your pet's microchip is metric-system-friendly and that all its paperwork is in order. I'll never forget the stunned look on one woman's face at London's Heathrow Animal Reception Centre, when she learned her dog had "flunked" because of the wrong microchip. To add to the confusion, the rules are not the same for every EU country. England, Ireland, Sweden, and Malta have the most stringent requirements (and, at six months, the longest delay before pets that fail them are allowed on foreign soil). And forget about the family parrot or gerbil. The rules for North American pet owners apply only to dogs, cats, and ferrets. Each person can take up to five pets, if they are not one of the banned breeds or types. Britain's Dangerous Dogs Act bans all "fighting dog types." Each airline also has its own "no-fly" list. To avoid quarantine, pets must fly only on specific routes and airlines. London-bound pets from Boston fly into Heathrow on either British Airways World Cargo or Virgin Atlantic Airways. Our dogs' 10-hour Virgin Atlantic flight from Chicago to London went without a hitch. The reservations clerk took plenty of time to answer my questions. The trans-Atlantic flight for pets is safe and temperature-controlled. The traveling crate must be roomy enough to meet the strictest airline requirements and still fit through the airline's cargo door. It must be large enough for the animal to stand, turn, and lie down. Taking pets overseas doesn't come cheap. By the time Abbey and Grace landed at Heathrow, each dog had cost us more than $1,660, including vet and lab fees, crates, the flight, and final collection and handling charges. Elizabeth Armstrong Hall can be reached at lizarmhall@mac.com. Microchip: Ask your vet to fit your pet with a metric-system readable microchip. Keep the number handy. Rabies vaccination: Your pet must be at least 3 months old. Blood test: One month after the vaccination, your vet must take a blood sample to show the animal is rabies-free and send it to an approved lab. The date of the blood test starts the countdown before your pet can enter a European Union country. Third country veterinary certificate: Your vet records, your pet's details, and lab results go on an official vet certificate, which serves as its "passport." Certification: The US Department of Agriculture State Veterinarian for Massachusetts must certify the vet certificate. Reservations: If you're traveling on the same flight, you'll have to make two separate reservations. You'll need your pet's weight and carrying case dimensions. Tick and worm treatment: Between 24 and 48 hours before departure, your vet must treat your pet for ticks and tapeworms and record these details on the third country veterinary certificate. Bon voyage: Build in enough time to take your pet to the animal departure location and for a walk before boarding.